I always use NUnit to write my unit tests but now at Intergen I also use Microsoft Visual Studio Team System Unit Tests. Today I was stuck by a very basic problem and here it is. 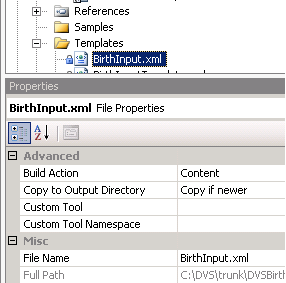 I have a XML file in my project which is added to the output directory when compiled. When I was running my unit tests against this, Visual Studio threw me this error saying that it couldn’t find the file! I was really surprised as my XML file is said to copy to output directory and the test fails saying that there is no such file. Checked my Test Solution’s output directory and found that there is indeed the Templates folder and the XML file. So, whats the problem? Why is my test failing? Well, the VSTE has a separate directory where it stores all its test results. The directory can be found in your root directory of your solution under the name TestResults. The TestResults also have various folders for each test run you do. If you refer back to the error image that is attached above, you could get the exact directory name. So, the VSTE did not copy the Templates directory to this ‘dynamic’ (for each test run there will be a directory created : correct me if am wrong here) directory. How do we do this then? The answer is with the Local Test Run Config’s Deployment settings. You can find the local test run config in your solution browser. 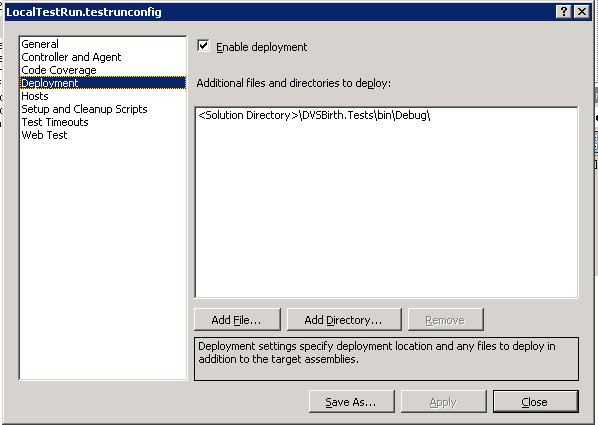 Double click the file to open the properties dialog and go to the Deployment section. Suppose we have an Inerface called IFooDatabase . Think this Interface as our gateway which will provide us with basic database operations. Now, how does Mocking come here? – My friend is still working on this database layer but he has given me already the Interface with which he is implementing the Database Class, so that I can make use of that and mock, as if that database layer exists and test my program against it. My friend told me that he is going to add events for each database operation, like InsertEvent, UpdateEvent, DeleteEvent so that they may be raised for each insertion, updation and deletion operations respectively. I was pretty happy that my friend provided me an Interface to mock all the database activities, but I was really stuck on how do I test all those Events are raised! RhinoMocks provides an interface called IEventRaiser which you can use to raise events! You may complain that I have used the generalized EventArgs and completed this post. What about custom EventArgs? The FooDatabaseEventArgs is our custom EventArgs. My last post on Mock Objects explained briefly about what is Mocking and gave you an example. But that example is not explained and thought let me explain and how Mocking plays its part here. The BL interacts with DL to perform database operations and SL sends requests to BL in regard to what needs to be done. In computer programming, unit testing is a procedure used to validate that individual units of source code are working properly. A unit is the smallest testable part of an application. The goal of unit testing is to isolate each part of the program and show that the individual parts are correct. A unit test provides a strict, written contract that the piece of code must satisfy. What does that ValidRegisterDelegate do? It checks whether the input parameters that is being used to invoke Insert function is of expected type and has expected values. Its more of a RhinoMocks feature, so once you start using it, you will get used to it 😀 . And RhinoMocks follows the Record and ReplayAll method where we set expectations means that we record something and once we say to verify, it replays all the set expectations when invoked. The expectations we set are very simple. When the Translate function is called with an input parameter of type AdminEntity, return an object of type Db.Admin . Similarly for Insert function, except that we don’t return anything. So, Unit Testing covers testing each individual part in your program. In other words, when we say we are unit testing a Component A, we actually test the functions, properties etc., inside that component. For Component A , we write several unit test cases and test it. Since this component does not depend on anything else, it is fairly easy to test all the parts of the component and hence it satisfies the definition of Unit Testing. How do we test Component B now? 4) If we test along with Component A with Component B, its not Unit Test, rather its, Integration Testing! In object-oriented programming, mock objects are simulated objects that mimic the behavior of real objects in controlled ways. A computer programmer typically creates a mock object to test the behavior of some other object, in much the same way that a car designer uses a crash test dummy to test the behavior of a car during an accident. So, its kinda Fake Object, but a Mock Object has some expectations and results being set on it. TDD has hence allowed to make changes to your design now and you would have changed tests accordingly. What I do is, test each individual components, layers in my project before its being used by other components and layers. So, currently am testing the Database Access Layer (DAL). Testing DAL is more tricky and many people follow different methods. So, which is best? – That really depends on your interest. For the Repository Pattern and in-memory database you may need to write a full length code which does similar job as your DAL, and that requires some amount of your development time. Development database means that each developer will have access to a development database in his local machine or network server. This is also good because you test as what would happen in the real time. Live database is same as development database, except that you are in high risk as you are working against the live database! I ran into more problems of implementing the Repository Pattern as my DAL is LINQ-to-SQL and though there were few posts about how to unit-test LINQ-to-SQL layer, It was ending up doing more work for testing! So, what I did was – I maintained my table data as Lists and passed on to DAL and tested against them. The data that resides in my list is the data that is already present or in other words, the data which I have put in my development database. You can see that if the Assert passes,we delete that item from our list. I was introduced to TDD by my friend Ivan and now I firmly believe that TDD is the right development technique and practice that every developer should acquire. Normally, we are taught the general development principle – “Design, Code, Test, Release (DCTR)” – This is the Model which most of the developers/companies follow. But with TDD it becomes – “Test, Code, Design“. What is the big difference here? Yes, there is. With the DCTR approach, your whole development process depends on the design and you strictly follow the design to release the product. The problem comes when there is a need to alter the design and change the code. It becomes very difficult here as your code and design are tightly coupled to each other. With TDD, you write tests for what your application has to do, which ultimately will lead you designing your application. Test-Driven Development (TDD) is a software development technique consisting of short iterations where new test cases covering the desired improvement or new functionality are written first, then the production code necessary to pass the tests is implemented, and finally the software is refactored to accommodate changes. The availability of tests before actual development ensures rapid feedback after any change. Practitioners emphasize that test-driven development is a method of designing software, not merely a method of testing. – Lets say you want to write a function to add two numbers. It takes two integers and returns the result back to you. This is very very simple example , but I do think its a good place to start. I would suggest writing small programs first and then slowly incorporate the TDD style in your projects.